Everything you’d expect and want from a mainline Forza game, even with a few controversial changes. Forza Motorsport 7 has the unsavory task needing to be a better game in every aspect than its predecessor was. Quite a bit is riding (pun intended) on it being a serious showcase not just for a long-running Xbox franchise, but for dedicated racing fans as well. I’m mostly happy to report that it doesn’t disappoint on either level, especially as a showcase of what solid evolution looks and plays like. All this, despite being the seventh entry in the series – and third iteration on the Xbox One to boot. Forza 7 is exactly what you want and nearly everything you’d expect at this point. It’s not an stern exercise in technicality like we saw in Project CARS 2, but continues to fold in simulation elements in more agreeable layers. Now, driving assists can be changed mid-race to acquaint yourself with tougher races and temperamental vehicles, along with the franchise’s signature “Rewind” function to aid in those foreseeable case of mulligans. Mods return to offer bonus XP and/or credit by encouraging you to drive with a certain assist disabled or passive challenges during a race, once again incentivizing players to drive with a little less hand-holding. The basic function is largely unchanged, but acquiring mods, cosmetic racing gear that give your Drivatar some personality, and the occasional car are handled through the purchasing of “Prize Crates”, similar to loot crates with a chance to get random goodies and some rare items. However, while you can spend thousands of in-game credits (CR) there will be microtransactions that require real-world currency, an addition that’s already received fierce backlash from the community, causing developer Turn 10 announcing a partial reversal on some VIP features. 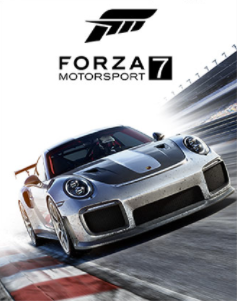 It remains to be seen how the repercussions of “pay to earn” in lieu of a mostly skill-based structure will affect the longevity of Forza 7, but the core gameplay remains solid with physics improved in meaningful ways. Chief among them is the dynamic weather which sprinkles on the active changes from sunny to reduced traction when overcasts brings in rainfall, and hydroplane-inducing puddles that force a change in how to attack road conditions. Advanced players with the appropriate steering wheel controller will benefit the most from the added variables of each track, coming fairly close to what you have drove in real-life (or probably dreamt about driving). The Porsche 911 GT2 RS in particular has characteristics of the front end lightening up under acceleration and requires some finesse at high-speed turns; a car with a strict learning curve without the disorienting G-forces involved. However, newcomers will not experience this thrill immediately as better cars are paired to a tier system, along with the amount of needed credits. While you start with hatchback series and other homogenized ranks, to the eventual Forza championships, limiting your Drivatar class to vehicles matched to your campaign progress. This change attempts to make the challenge equal but feels unnecessary since you have to start from the bottom anyways. Of course, we have to talk about the presentation taking on a more casual, community-derived feel that is more Forza Horizon 3 that just another rigid motorsports game. Specifically, the dressing up of your representative driver character can be decked out in various suits and outfits, everything from racing suits, bandana-masked urban outfitter, to even clowns and astronauts can be had for some uniqueness. The styles are purely aesthetic but represent a decent breakaway from the usual sim-racing mentality. Another reason for the emphasis on graphics is banked on the high hopes of the Xbox One X, hailed by Microsoft as “the most powerful console ever made”. Clearly, Turn 10 Studios did a stellar job as a whole with gorgeous looks incorporating a sense of hyperrealism, with added color vibrancy and models to keep everything visually balanced. It is also inevitable that we compare this against Project CARS 2 because that game is a straight-up simulator with a similar focus on meticulous graphics. Forza 7 will be more appealing in portraying a sense of drama to the races. But for CARS 2, the details in lighting effects and fluidity are much more accurate while Forza 7 settles for having a larger quantity of cars (more than 700) and full walkaround/interior viewing through Forzavista mode. We played this on both Xbox One and Windows 10 via Xbox Play Anywhere, experiencing Forza in beautifully superfluous 4K and HDR. Both look great, but if you’ve got a PC with the chops we fully recommend going that route for the ultimate racing foray, or at least until the Xbox One X comes along. On the flipside, it’s a bit of a tease till November to see a flagship game blossom into its complete glory. Despite the questionable use of campaign mode tiers and a rewards system that’s even more controversial, Forza Motorsport 7 is a superb racing game. The series remains accessible with tons of cars and a nod to car culture through driver personalization, and visual improvements. While it may not be as radical as the previous title, Microsoft’s marquee racer remains instantly familiar and just as hard to walk away from.